Angelic faces: Back from left, Moseka Balanga, Salimata Loleke, Jeannette Mukankusi, Aline Twibanire, Katum Loleke, Prudence Melom, front row, Joselyne Byamungu, Faida Mwibusa and Buloze Mwibusa. WHEN Congolese refugee Moseka Balanga began working at St Saviour’s College, Toowoomba four months ago, she had no idea she would be working with “angels”. With a background in percussion, she was asked to help train the school’s newly- formed African vocal group, The Malaika, which is Swahili for angels. The group is made up of eight students, all of whom are daughters of refugees who fled Sudan, Congo, Chad, Burundi, and Liberia for Australia. Most of the girls have been living in Toowoomba for less than three years. The Malaika formed earlier this year, when they discovered they could sing as a group. “We knew each other, but we didn’t know we could sing together,” Year 12 student Prudence Melom, 18, said. “It’s like God planned it. With the direction of their teachers Mrs Balanga and Year 11 and 12 co-ordinator Leah Bowes, The Malaika have been rehearsing for performances at their school. Their biggest performance was at the recent Queensland Catholic Music Festival, held in August. They were awarded the Gold Award for vocal ensembles. Miss Melom said “singing is our passion”. “We just like to share the Word of God through our singing,” she said. 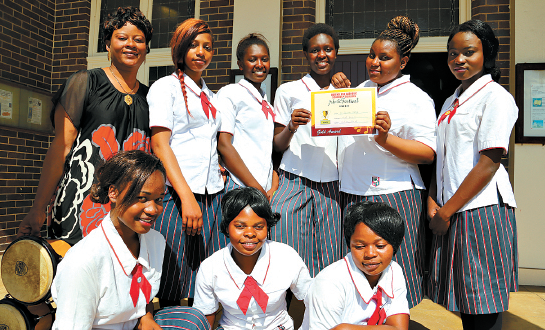 St Saviour’s College principal Margaret Battle said the girls’ confidence and literacy skills were improving as a result of starting the vocal group. Mrs Battle also praised the work of Mrs Balanga, who is at the school as part of the Work and Welcome program. The Work and Welcome program invites local refugees to work in schools on a paid basis to develop skills for future work or study. “Moseka has wonderful skills in bringing the girl’s vocal ability out,” she said. “It’s been a project in the school to help with cultural identity and appreciation, confidence, and it gives the girls a sense of place.